RDX is the ideal choice for businesses that need simple, fast and reliable backup for workstations and small servers. 1. With 320GB, 500GB, 1TB, 1.5TB or the just released 2TB capacities, there is one for every size of server or workstation, with desktop and server/rack options. 2. RDX has a lower cost of ownership than DAT over the life of the device. 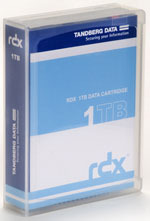 RDX cartridges cost more up front than DAT tapes but you will not need to keep replacing them, which makes RDX cheaper overall. 3. RDX backs up data at hard drive speeds and restores critical files in seconds via USB 3.0. A 1TB restore takes around five hours to complete with RDX, but can take weeks via a cloud provider, even with the fastest broadband connection. 4. RDX just works. Backup happens automatically in the background using Continuous Data Protection (CDP) or scheduled routines. You can even just drag and drop files via Windows or Mac OS X Finder. RDX includes Windows backup mode to leverage the benefits of integrated applications on that operating system. 5. 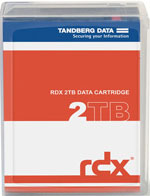 RDX eliminates all the guesswork of backup. Cartridges cannot be removed while backups are running or scheduled. Staff can safely run local backups and rotate media without specialist skills or training. 6. RDX is very durable. With a usage life of 5,000 load/unload insertions (compared to 50 for DAT tapes) and a 10 year archival life, you can safely move data off-site for disaster recovery, archive, or data transfer. 7. Unlike DAT or standard USB drives (even so-called ‘rugged’ ones), the enhanced design of RDX makes it dust and static proof. It has a sealed interface so dust and debris can’t get in. Plus, there is no media or drive wear during operation. 8. RDX has internal buffers to protect against harsh treatment. In independent tests, it had a 97% drop test survival rate compared to 0% for ordinary USB drives. HP even tied it to a dragster and ran it up a raceway at 170 mph over a quarter of a mile. It still worked flawlessly! 9. RDX protects your investment with complete backwards and forwards compatibility. So today’s hardware will work seamlessly with tomorrow’s higher capacity cartridges. 10. RDX is proven to meet the needs of single server businesses. Over 500,000 companies use RDX today.